Yes, it’s April Fool’s Day but it’s also Pillow Fight Day. Don’t google “pillow fight” unless you like seeing scantily clad women merrily swatting each other with bedding. I’m pretty sure I’ve never had a pillow fight in my life. But then I’ve few cousins who don’t live together and never been to camp or somewhere that this is possible. Dear people who have had one, do relate for context. I’m with you, Sure Thing. I grew up with six siblings, and not much money, a pillow fight would have been frowned upon. Beds were to be made before breakfast, and definitely not for play. Play was for outside. Now sticks for swords, that I can get behind. Sticks for swords work even when you’re alone. And a large piece of left over fabric for a cape to swish over my shoulder. In my reality pillow fights only happen if you’re little, playing on the bed (usually your parents) and arguing with a sibling, then you bash them with one, before your mother catches you. I think I’ve been in a pillow fight during a sleep over. However, 8 year olds tend to be clad in flannel pjs and not lacy things, especially in the winter. 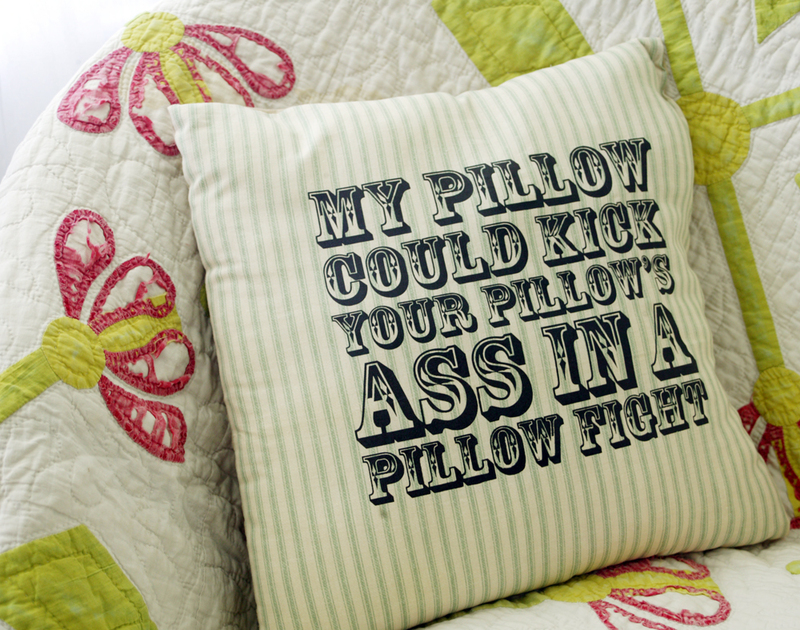 Sure Thing – imagine taking a pillow and hitting a person with it. They have one too and strike back. Add in 3 or 4 more people all swinging pillows with random abandon at any other human nearby. You have a pillow fight. Now, I’m off to fix breakfast and read the new breakfast scene. Life threw me a few curves this week, so I’m behind. Lol. I’ve seen movie depictions. It’s just methinks parents would be ruthless about controlling that sort of thing in case someone’s parents decided to sue over an injury. So true nowadays. There were fewer lawyers when I was 8. I’ve only been in one pillow fight and that was by accident. My roommate’s boyfriend accidentally hit me in the side of the head with a throw pillow and the fringe wrapped around the arm of my glasses, flinging them against the wall and breaking then at the nosepiece. It was a long 3 weeks until I could afford to replace them. yeah, as someone who’s worn glasses since 11, the joys of games where you hit each other in the face were not apparent to me. Jumping around on the furniture, because if you touch the ground it’s lava! That I get. Me too! My sister and I played the floor is lava all the time. Tall Boy looked at me like I was crazy when I told him about it. He had never heard of it. Poor kid. Definitely a thing I did with cousins when we were in the 6 – 10 range. Less potential for injury to each other than wrestling, but more potential for injury to the furniture, because swinging a thing that extends your reach with wild abandon isn’t great for the safety of things on low tables. We had pillow fights when we were kids but the last one I was in involved in was a few years ago when I was on a road trip with two of my sisters and we had a spur of the moment pillow fight in the hotel room. If I remember correctly, my youngest sister started it. We had so much fun and laughed ourselves silly. San Francisco has an annual Valentine’s Day pillow fight on a big downtown plaza. This year 1,000 people went. I’ve never gone, but from the photos, everybody has a lot of fun. With my husband. And there are no innocent endings. In my corner of the planet there is the “Valentine’s Day Great San Francisco Pillow Fight”. This year was the 12th annual gathering. It looked like folks were having a lot of fun, though it was hard to see through all of the feathers floating around. I vaguely remember a few pillow fights from when I was a kid, though I’m pretty sure they only happened when my parents were not around. They would not have been amused. Of course we waited until the ‘rents were out of earshot and used only the oldest pillows. It also didn’t hurt that pillows cost much less in those days. My Mom only got really mad the time that a pillow burst and covered the carpet with feathers. But, we had so much fun that she forgave us pretty quickly. I could use that kind of fun today. My father died 3 weeks ago and when I went back after a quick trip home, I ended up in a hospital for 5 days. My sister, who was planning to come to stay with Mom after I left, ended up running back and forth between Mom’s house and the hospital for 5 days with her 12yr old grandson in tow. We are all exhausted and I have to follow a diet for the next week that is the total opposite of what I usually eat. Since the only soft/low fiber food I really want to eat is ice cream, I hope my pants still fit at the end of the week. So sorry to hear this! Best wishes for a swift recovery, and for your family in a difficult time. You’ve had a rough time of things, Aunt Snack. Let’s hear it for sisters. Oh, my sympathies on your loss. And healing vibes for recovery. Try rice overboiled with Tumeric and salt and a hint of favourite spices like cumin. In a separate pan fry finely chopped onions in ghee (clarified butter) until golden. Add to rice. Stir. Serve. This is my go-to soft food/comfort food. Overboiled means the rice grains break and you dont strain out water you cook it in. No pillow fights, but one of my brothers was wicked with a stuffed snake. My son and his friend played “hot lava” outside: you couldn’t step on the sidewalk, or driveways, which made it challenging to walk the friend back home.